Chimneys - White Chimney with Three Chimney Pots and Two TV Arials. Cobbles - Closeup of Double Yellow Lines on a Cobbled Street. Lights - Brass Light Switch with White Plastic Switch. Rope - Knots in Rope Connecting a Metal Pole and Brick Wall. 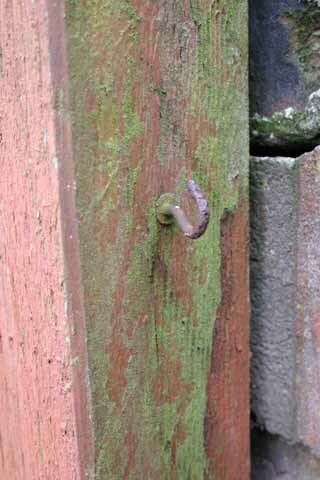 Image Description : Rusty metal cup hook screwed into moss covered wooden pole. For more Abstract Photographs, please use the menu on the left to view the free images. If you would like to use this image of Wood - Moss covered Wooden Pole containing Metal Cup Hook (at High Resolution - Royalty Free), we now offer a CD full (600Mb+) of Abstract Photographs images (200+), which can be purchased for only £30 including VAT & P&P. The CD includes all the images from this website in ready to use JPG files, each of 2Mb to 4Mb. Click Here for to buy our Abstract Photographs photo CD.